Abdullah Bego: Gov. Ibrahim Gaidam has signed into law the 2019 Finance and Appropriation Bills passed by the State Assembly. 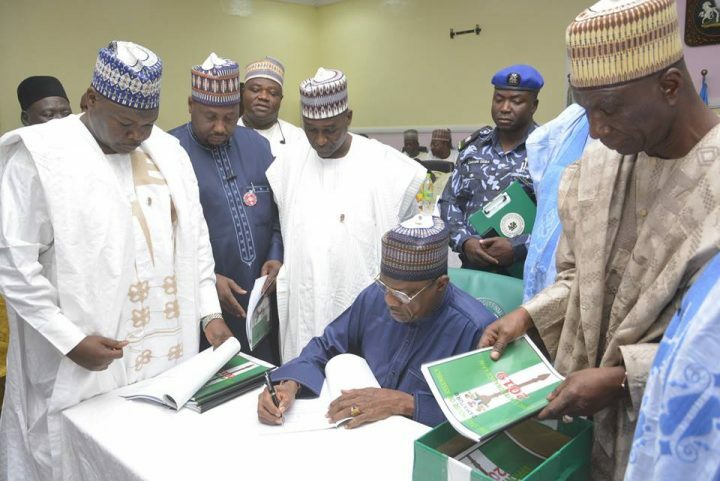 In a ceremony at Government House Damaturu today, the governor thanked the State Assembly for their “meticulous scrutiny, objective assessment and speedy passage” of the budget. The budget, as passed by the House, retained the size – N91, 647, 597, 000 – originally proposed by the governor when he presented the estimates to them at the end of November last year. The governor revealed, however, that the House had made some adjustments in the allocations for recurrent and capital expenditure, with “a slight decrease in the allocation for capital expenditure and increase in the allocation for recurrent services”. The net allocation for capital projects, the governor said, stands at N41, 378, 630, 000.00 or 45.2% of the budget size while N50, 268, 967, 000.00 or 54.8% stands as the net allocation for recurrent expenditure. H.E Gov. Gaidam also revealed that the State Government will begin implementing the 2019 budget with an opening balance of N13, 117, 944, 830.00. Speaking about last year’s budget, Gov. Gaidam said his administration had achieved an overall performance of 74.4 percent. “I wish to reassure our citizens that in the implementation of the 2019 budget, we shall continue to be resolutely committed to adhering to the well cherished principles of accountability, probity, transparency, and strict observance of due process and budget discipline”, the governor said. H.E Gov. Gaidam also stated that the administrtioon will take further steps to enhance internal revenue generation and ensure effective monitoring of revenue collection and remittance. H.E Gov. Gaidam has also launched the 2019 Armed Remembrance Day Emblem Appeal Week with a state government donation of N25 million and N15 million for local government councils. The governor also made a personal donation of one million naira. In his speech on the sacrifices made by fallen heroes, the governor asked people to “reflect on the hardships undergone by members of the Nigeria Legion…who have sacrificed their lives to resolve conflicts and pave way for peace to prevail not only in our communities, our country but also different parts of the world”. Several senior officials including members of the state assembly, members of the state executive council, chief executives of government agencies and departments, emirate councils, as well as other well-meaning individuals made donations to the Legion.